You have chosen the Gossen Metrawatt SECUTEST SIII+ model M7010-B2-C1-F0-G0-J0-KA0-KB0-KD0-KE0. This model gives you the ability to carry out the following electrical safety tests; ‘Protective Conductor Resistance Test’ at either 10A AC or 200mA DC, ‘Insulation Resistance Test’ at 50…500V DC and Equivalent Leakage Current Test’ 0…120mA. What we like: The Secutest SIII+ can be purchased in a number of different configurations especially to support your test application. All you need to do is chose the correct option from the dropdown menu, we have kept this as simple as possible by offering you all of the popular Secutest SIII+ options. Choose from a range of pre-configured units covering all popular domestic, commercial or medical equipment electrical safety testing. Measurements and test sequences can be performed in accordance with National & International Standards. Run through your test sequence automatically, including protective conductor resistance, insulation resistance & various leakage current tests. The tester offers user safety features including ‘Power Shutdown’ as soon as the leakage current exceeds 15mA, this provides maximum safety for the user. Manufacturer’s calibration certificate is included with all options. Once you have chosen the specific SECUTEST SIII+ that you require a wide range of tests can be selected manually or run automatically including protective conductor resistance, insulation resistance & various leakage current tests including special options for electrical medical equipment with a ‘patient leakage’ test at up to 10 applied parts. 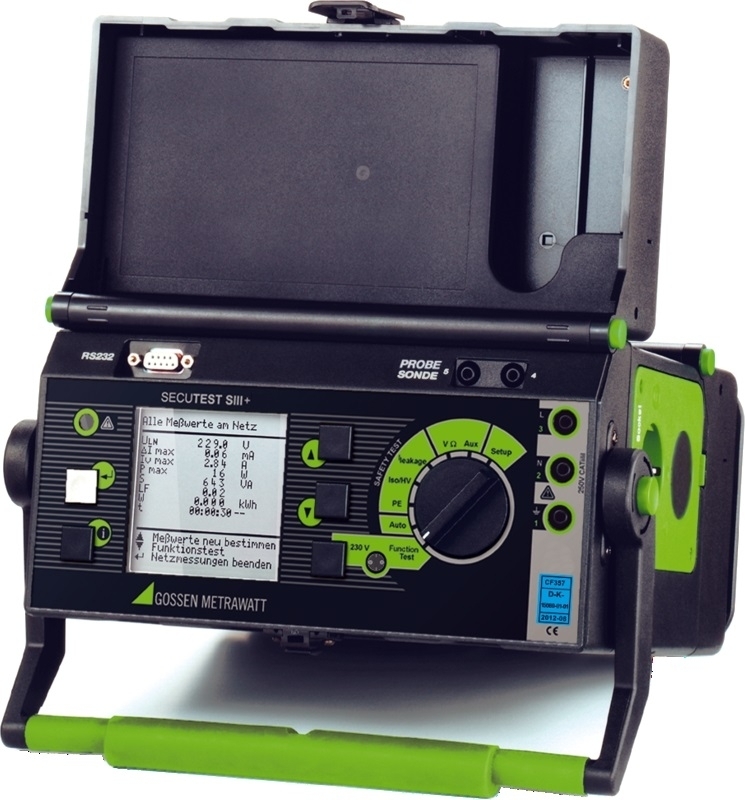 A function test is available allowing a comprehensive range of measurements including line voltage, residual current, power consumption, active and apparent power, power factor, electrical energy and run-time. Also for fault finding and testing the SECUTEST SIII+ can accept test leads to enable various multimeter functions including AC & DC voltage, resistance, voltage, current (with optional current clamp) or temperature with optional (Pt100 or Pt1000) probe. The test probe uses a 4-wire method to allow for Protective Earth to be tested at differing lengths for larger electrical equipment. Once you have established the control standard that you need to comply with you then need to choose the test current required for ‘Protective Conductor Resistance Testing’ and if you are testing medical equipment you will need the ‘Patient Leakage’ test option. All of these features can be chosen via the dropdown menu. With the addition of the SECUTEST SI+ option expands the basic instrument into a unique data logger with memory and alphanumeric keypad for data entry and the Secutest PSI offers additional integrated printer. All required reports can be generated, and data can be analysed and managed with the help of user-friendly WINDOWS software.